"It's just like UO's radar map (only better)!" UO Auto-Map (UOAM for short) is a supplement to UO's radar map. You could call it a kind of GPS for UO. 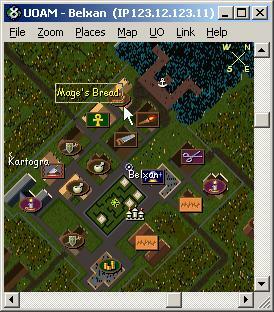 It's a utility that displays a portion of Ultima Online's map. The map can be scaled, tilted to match UO's orientation, labeled and configured in a number of different ways. You can even link up with your friends and have UOAM keep track of their locations as well. Works with all versions of Ultima Online including Samurai Empire. Allows you to link with your friends and keep track of everyone's location in the game. Lets you chat with your friends while you play. The map can be oriented with North at the top or tilted 45 degrees to the right just like UO's radar map (only better). The map can be zoomed and resized. Any location on the map can be labeled and categorized. Labels are configurable: choose any icon, font, size or color. You can define your own categories. Places can be grouped and stored across multiple files. Labels can be turned on or off as a whole or by category. Find any spot on the map by name or by category. Keeps the map centered on your player, just like UO's radar map (only better). Super easy setup. No extra utilities to run. No special codes to enter. Labels are available for nearly all of the major locations in Britannia and the Lost Lands. But best of all it's free! UOAM has been tested on computers running Windows 95, Windows 98, Windows NT, Windows 2000 and Windows XP. Pretty much any system capable of running UO should be able to run UOAM. To install UOAM, just click on the installation link found below and choose "Run this program from its current location." Then after you have carefully read the license agreement, click the [I Agree] button and follow the simple directions. IMPORTANT!! YOU DO NOT NEED TO REGISTER UOAM! Just click OK when it asks. I'm no longer updating UOAM so don't register unless you feel like giving me money. If you are upgrading from a previous version of UOAM, just run the setup program and install the new software right over the top of your old version. All of your old settings will be preserved. For those of you looking for a non-English language version of UOAM, all language versions are installed through the same setup program. Install the English version and UOAM will notify you when new langauges become available. If UOAM isn't currently available in your language and you would like to help change that, send me email. Note if you are behind a firewall or going through a proxy-server then you may experience difficulties with the updater. Take a look at this entry in the FAQ and if that doesn't help then you can download the files by hand from here. Click here for instructions on installing .MAP files. Click here for a log of changes to UOAM. Before you send me e-mail asking for help with a problem, please read the FAQ to be sure your problem isn't addressed there. I'm happy to answer your questions but I'm even happier when those questions aren't already answered in the FAQ. Reporting problems: If you have a problem to report, it is very important that you send me the complete circumstances of the problem. I need to know the complete text of any error messages you recieve, whether you are behind a firewall or proxy-server, which OS you are running and exactly what the program was doing when it failed. Here are a few tips to help you get the most out of UOAM. First of all, realize that the single best tip I can offer is to read the documentation. There are a lot of features in UOAM and you are sure to miss some of them if you don't bother to read all of the documentation. If you aren't running UOAssist then you are really missing out! Houses and boats will show up in UOAM just like they do on UO's radar map. UOAM can display notifications for things such as players going into Panic! mode and directions to a marker or player right in the game window. UOAM can be controlled from directly within the game. UOAM can automatically map out the player structures on your shard as you walk past them. You'll never need to calibrate UOAM again. Check out the section on the new UOAssist pane for details and a complete list of UOA enhanced features. Most of UOAMs features are accessible from the control panel. The easiest way to get to UOAM's control panel is press the ESC key while UOAM has the input focus. and F1 takes you to the Info pane. For a complete list of short-cut keys, choose the Short Cuts menu item under the Help menu. Here's a hint for all you treasure hunters out there. UO's treasure maps are generated directly from the same map files as UOAM's map. If you zoom UOAM out to 1/2 zoom and turn off the tilt (press Ctrl+T until North points up) then UOAM's map will be the exact same scale and orientation as your treasure map. At that point it's a snap to find exactly where the pin is located, especially if you have downloaded UOAM's Treasure.MAP label collection. If you double click in the map window, the title bar, menu and scroll bars will disappear and the map will be made top-most so it will float above all the other windows on your desktop no matter which application has the focus. This means you can put UOAM right over the game window just like UO's radar map (only better). Double click on the window again to get the menu back. Or just click on it with the right mouse button to get a popup menu that has all the same options as the main menu. 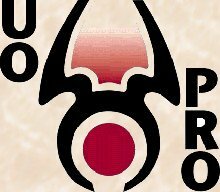 This is a "UO Pro" Utility, which means that its use promotes and is in keeping with the spirit of the Ultima Online product, community and value system, and the use of this utility by players will not be considered by Origin Systems, Inc. as cheating. This product was created, and is marketed and distributed by Steve Blanding under license from Origin Systems, Inc. ORIGIN SYSTEMS HAS NOT TESTED THIS PRODUCT IN ANY WAY WHATSOEVER AND DOES NOT KNOW WHETHER IT WORKS IN ANY OR ALL REASONABLY FORESEEABLE SITUATIONS OR THAT IT WILL NOT CAUSE DAMAGE IN SOME REASONABLY FORESEEABLE SITUATIONS. Steve Blanding solely warrants that this product will work as intended to your reasonable expectations, and does not infringe anyone's intellectual property rights. To verify that this product is a "UO Pro" utility, please go to Origin's website at http://support.owo.com/uopro.html and locate the name of this product. Follow the link on Origin's page back to this site. If you can't find this product listed on Origin's website, then this product is not an approved "UO Pro" Utility. Any and all unauthorized use of the UO Pro logo and/or other false claims of approval are strictly prohibited and shall be prosecuted. Ultima Online and Origin are trademarks of Origin Systems, Inc. Used by permission.